Tura New Music’s biennial Totally Huge Festival of New Music is a major event in Perth. 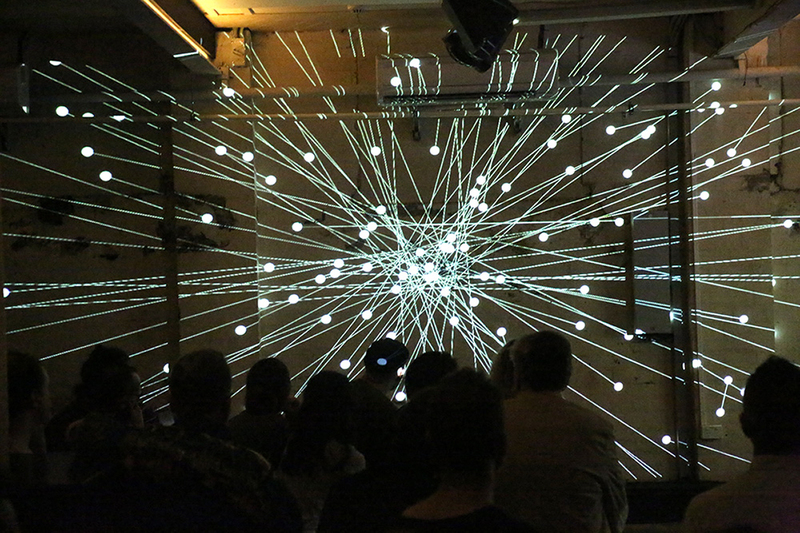 2017 was notable for two immersive works which offered what one might call a “phenomenal” experience — DCC: Glitch and A Wave and Waves — which provided a combination of felt sound, perception of duration and the sonic dramatisation of space. Featured artist Anne LeBaron was also superb, mixing an arguably more conventional concert model with outrageous fun in open-ended, semi-improvised provocations closer to her early work with avant-garde rabble rousers Raudelunas. Early in the program, DCC: Glitch featured Mitsuaki Matsumoto on amplified biwa (a Japanese lute-like instrument), accompanied by Kouhei Harada on laptop, while Shohei Sasagawa managed projection. Although the soundscape certainly had glitchy elements akin to say Fennesz and Frank Brettschneider, the broad palette was closer to the razor sharp, bleeping tones and punctuations of minimalist electronic compatriots such as Ryoji Ikeda. Matsumoto led with fairly distinct, harshly plucked notes, initially on his own, before being joined by Harada. The use of a wonderfully precise surround system made sitting in the centre, as I was, an almost hyper Wagnerian experience in the heart of a clinical digital maelstrom. Sounds moved about, at times crossing at angles before engulfing one from all sides. The graphics initially consisted of a shifting architecture of white lines against a black background, with various arcs hinged at rounded joints where they coalesced. With different intensities and configurations of sounds, the armatures expanded and reconfigured themselves, before turning into coloured spots which gradually covered the wall, recalling painter Georges Seurat’s pointillism. The biwa playing was especially pointed, providing a useful counterpoint to a sound world which at times became more like an awesome textured mass, than a blending of distinct tones. The suite was broken midway by a silence of 4 minutes, 33 seconds (pace John Cage) and it was at this point that the audience discovered that exclamations and claps from them rendered the projected lines wavy as data from the room was fed into Sasagawa’s laptop. In short, it was a remarkably varied piece which by and large maintained a sense of exacting minimalism, that nevertheless delivered quite a dense wallop. 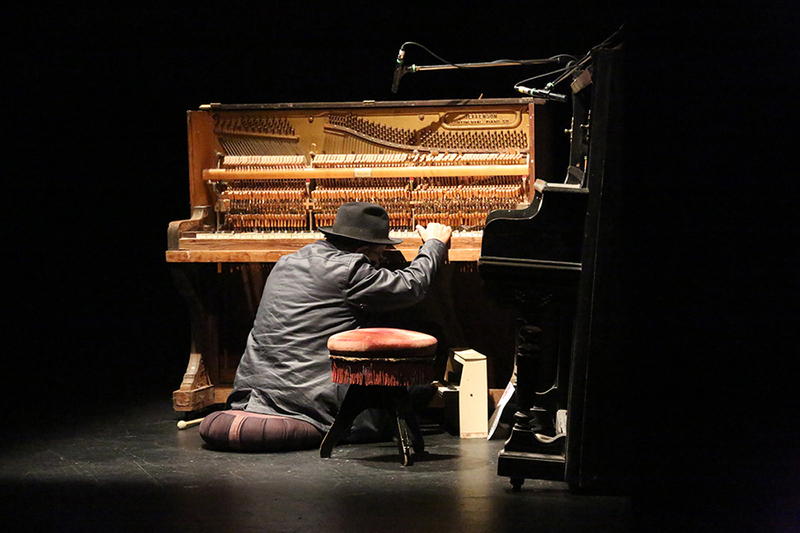 Ross Bolleter, a WA legend who plays “ruined” or severely damaged pianos, gave what was promoted as his “final public performance” at PICA, although at his artist talk there seemed some ambiguity regarding what constitutes either a “performance” or a “public” one. It was perhaps not surprising then that his presentation in the theatre of Quarry Music reflected a similar ambiguity. The work consisted largely of pre-recorded text which related tales of rummaging through a quarry for recyclables after World War II and the figures one might meet there, while the playback of plangent strumming of ruined pianos filled things out. Bolleter himself largely acted as a living sculpture, seated on the ground, back to the audience, his head against the piano frame, fingers occasionally stretching towards the strings or keys, but, more often than not, halting before playing. More frequently, Bolleter joined us in listening. While the presentation lacked the joyous sense of sharing in a moment of spontaneous sonic creation which characterised the last of Bolleter’s improvisations I attended, his outdoor concert at the York Ruined Piano Sanctuary for the 2005 Totally Huge New Music Festival, Quarry Music came across as a session of communal listening to a well presented CD, played back in a space populated by three restive sculptures: Bolleter and his two pianos. Composers Rick Snow and Chris Tonkin collaborated on the installation Mississippi Swan: Daybew into which they fed a diet of chart-topping songs, as well as text from international news streams and tweets. An algorithm then crafted an EP of stylistically related songs. Although programmed to leap from genre to genre when visitors hit a button, the algorithm is also meant to gradually acquire trends and tendencies. At the Totally Huge New Music Festival Conference, Tonkin played the first track it composed, a rather interesting skewed piece of techno music with angry, scrambled vocals, but this appeared to be a one-off. The program does indeed spit out songs which exhibit some recognisable stylistic features (the bouncing beat and echo of dub, for example), but after listening to about 30 tracks, I lost interest. The material is too stylistically inconsistent and weirdly jarring to work as generic pop or techno. Other than the first track, none seemed sufficiently way-out to offer an alternative. The screened video of a multicoloured glass swan tumbling along beside the abstract EP covers (the latter all using the same basic coloured roundel design) had a curiously hypnotic appeal, but if Mississippi Swan represents AI in music, then artists will depend on genius producers like Stock, Aitken & Waterman, Giorgio Moroder, Pharrell Williams and Timothy “Timbaland” Mosley, well into the future. 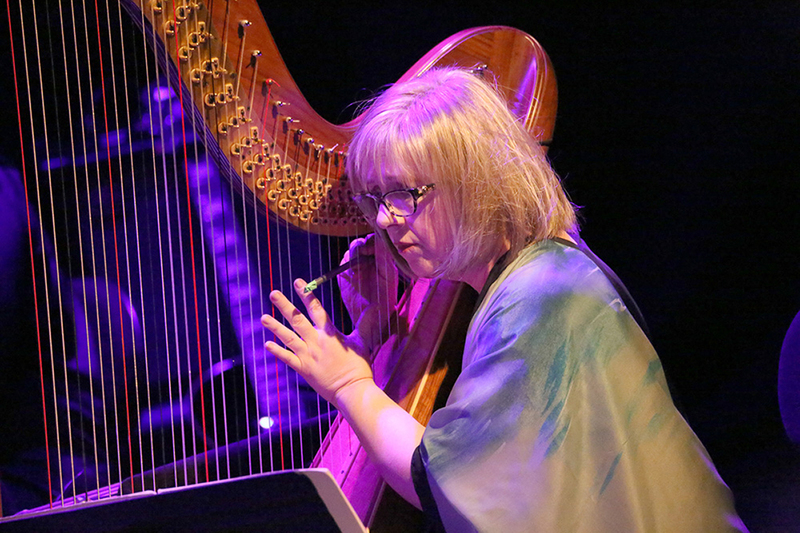 A festival high point was the retrospective of American composer Anne LeBaron’s compositions for harp and other instruments. After the composer performed the solo prepared harp piece Doggone Catact, Perth harpist Catherine Ashley joined LeBaron for the duet Infrathin I, which explored more extended playing techniques, including agitating rubber balls across the sounding box and frame. Doggone especially offered a series of discontinuous miniatures, with slack sounding twangs as well as sharp attacks. LeBaron, who has been producing works since the 1970s with both playful and demanding specifications, performs in a remarkably light and relaxed manner. Her notes seem to gently bend into the ear. The relatively young Ashley on the other hand performed with an intensity and hard grasp on the mechanics of the compositions which contrasted well with LeBaron. I Am An American… My Government Won’t Reward You was a well-balanced but nevertheless angry denunciation of “blood chits” — printed offers in multiple languages of rewards for those in foreign countries who assist downed US airmen but which have been rarely honoured. Performed here on amplified solo harp accompanied by a recording of LeBaron’s premiere of the piece, it commences by evoking Jimi Hendrix’s famous shredding of the US national anthem, and then moves into spooky, scraped, echoed string sounds, together with a reading of the text of the chits, sounds of warfare and other material. Outside of this sense of fury and use of literal noises of destruction, I Am An American… is quite open and meditative, suggesting a metaphysical journey through modernity in its use of train whistles (shades of Steve Reich’s Different Trains), moving in an unhurried way towards a disappearing, bassy thrum at its end. LeBaron also conducted re-workings of two other pieces, the structured improvisation Infrathin II (slightly marred by a tendency of the performers to rather urgently attempt to foreground their own signature sounds) and Concerto For Active Frogs. The latter was composed by LeBaron for Raudelunas — a Midwestern equivalent to Fluxus, Neo-dada and the Mothers of Invention. It employs a Folkways recording of frog calls as a sort of score. 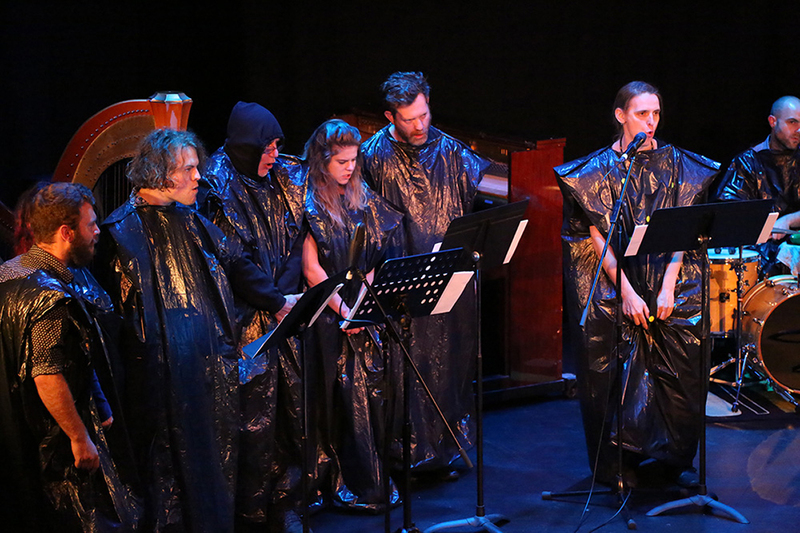 Here performed by a garbage-bag clad choir of singers, set against the extraordinary Perth experimental vocalist Sage Pbbbt as soloist, the piece was enormous fun, performatively engaging (Pbbbt’s grimacing producing a wide range of expressions from schizophrenic joy to grief) and quite acoustically complex. Highlights were the direct call-and-response sections between Sage and the choir, with the two groupings staring intently across at each other as croaks ping-ponged between them. A great piece of po-faced fun which also made for provocative listening. The festival concluded with the Speak Percussion ensemble leading 96 lay performers in Michael Pisaro’s suite for quiet percussion, A Wave and Waves. 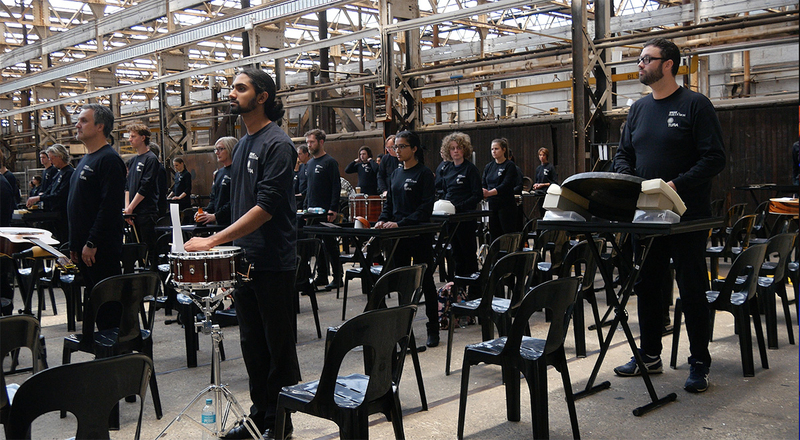 Originally produced as a multi-track recording for Greg Stuart, who radically reconceived his practice after an illness left him only able to perform small movements and quiet, subtle noises, Speak Percussion staged the work for the 2015 Melbourne Festival at the Meat Market with players spot-lit in a smoky room as audience sat on the periphery. In Perth however, Wave was presented as a kind of gentle equivalent of DCC Glitch, with listeners seated among a grid of standing performers, dressed in black, and all facing a set of screens which counted down numbers to cue their actions. The audience sat at right angles to this, in two blocks facing each other, intermeshed within the performance space itself: namely the spacious, aircraft-hangar-like former Midland Railway Workshops. Where the Meat Market performance was enhanced by the sound of proximate cars and inner city nightlife, Midland’s vast creaking venue cracked, expanded and breathed in the sun, as changes in temperature caused its aged metal shell to flex. The distant rumble of planes alternated with birdsong. The performed sound itself was a phenomenal, low key experience over an extended duration. Divided into two halves with a silent interlude, the second movement was relatively more active and noisy, and after the deep immersion in small sounds during the first movement, seemed if anything too much. As fellow audience member and local sound personality Rob Muir explained to me, the title A Wave and Waves refers not just to the sounds themselves, which accumulate very slowly in slightly irregular masses spread about the venue before they ebb and rise, but also to the audience’s attention, which similarly comes and goes, making the perceived noises at times seem much louder than in fact they are, before one falls again into blissful, curious somnolence. An exquisite work at every level, in terms of its elegantly simple and immersive staging and its mysterious sound palette (I later identified a steel bowl filled with gum leaves in addition to rice on drums and gongs of various sizes, bowed cymbals, sandpaper on various surfaces, and more), A Wave and Waves was not only experientially superb, but visibly well attended by diverse audiences from young families through to ageing sound junkies like me; an ecumenical way to end the festival.